Our Memory Superior 2000 Divan Set by Healthbeds features our Memory Superior 2000 Mattress which sits on top of a matching Divan Base that has handy storage options helping you to maximise the space that you have your iny our bedroom. Headboard not included. The Memory Superior 2000 Mattress by Healthbeds is a high quality mattress featuring up to 2000 individual pocket springs which each work independently to ensure that your body receives an excellent and precise level of support. These springs also work carefully to help to defer the transfer of movement, preventing the ‘roll-off’ effect for an undisturbed night’s sleep. These springs are then topped off with a generous 50mm layer of luxury cool memory foam which moulds to the sleepers body providing a tailored level of support as well as additional comfort and is developed to keep you cooler at night. A six gauge rod edge support ensures a stable sleeping surface right to the edge and this mattress is finished with a micro quilted cover for additional comfort and an attractive finish. A side stitched border provides additional support to the edges of the mattress. Air vents help to promote healthy air flow throughout the mattress helping to keep it fresh and hygienic. Flag stitched handles ensure that this mattress can be conveniently rotated with ease. The Memory Superior 2000 Mattress by Healthbeds is of a medium to firm rating. This would make an ideal choice of mattress for those who prefer the additional support of a firmer mattress without featuring any rigidity. 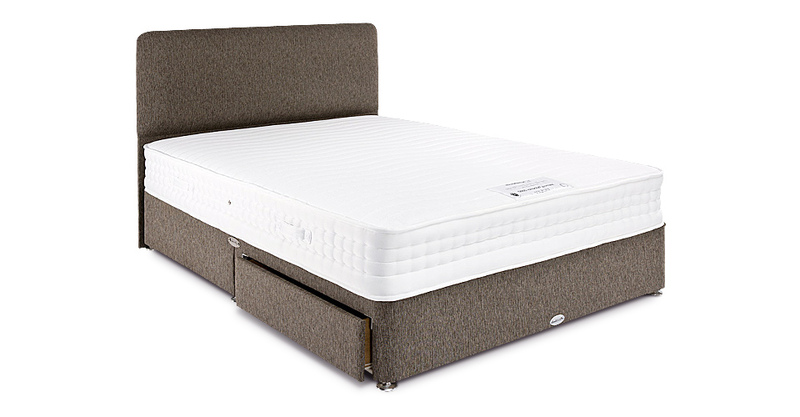 This is a high quality mattress by Healthbeds featuring a winning combination of individual pocket springs and memory foam for a super supportive yet comfortable sleeping surface for a great night’s sleep. Please quote this Products's code 25010DS to speed up your query if related. Memory Superior 2000 Mattress which sits on top of a matching Divan Base that has handy storage options helping you to maximise the space that you have your iny our bedroom. Headboard not included.